Lovely photo. What is the puzzle a picture of? nice photo nice colors. Kaotic. :) Sorry I am new in blog thing really. buna dimineata si la multi ani ! Been working on this sort of thing all over Xmas. There is only so much jigsawing that a Dad can do!!! What beautiful puzzles and colors! Thanks for sharing this. 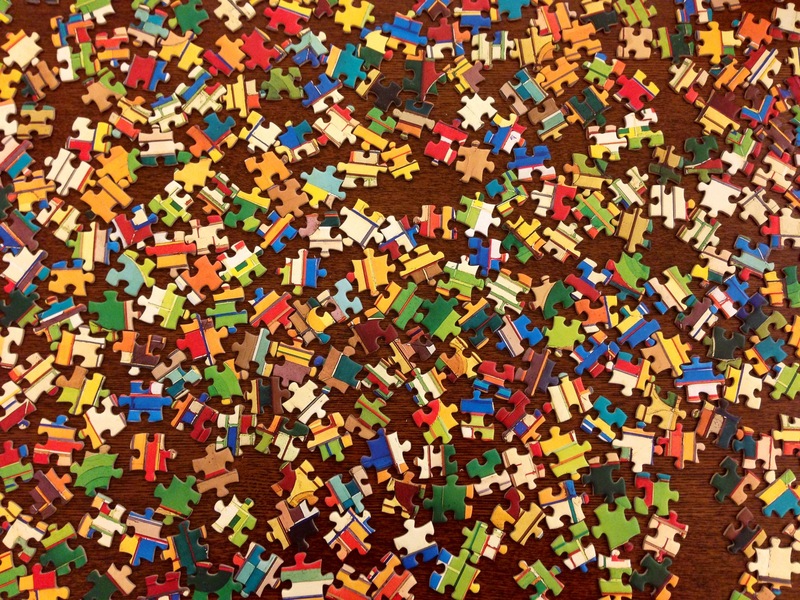 I just posted a blog on my four year old and lessons learned from watching him put a puzzle together. Love Life’s “synchronicities”! **Wow, now thats alot of color! Love puzzles, so wish i had the time! Reblogged this on Samm James…. Always. Wow! It’s pretty with all the cool colors. It would take me a long time though! I adore this guy’s photograph! Loved the puzzle ! Umm inviting ! Striking colours and shapes. i love this blog. it’s extremely beautiful. some of the things are very ordinary, but the pictures show the beauty in them in a very talented way. the food is appetizing. why the puzzle pieces? just because they’re colorful, or is there some kind of message here?